Students of Govt. 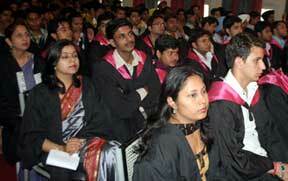 College , Sector-11 at their Annual Convocation on monday. Chandigarh, March 17:- 393 degrees were conferred at the Annual Convocation of Government College, Sector 11 here today. UT Home and Education Secretary, Mr. Krishna Mohan presided over the convocation and also distributed degrees to the students. Addressing the student in his convocation address, Mr.Mohan said that he is proud to be a part of this ravishingly beautiful city. He also said that education in the Government Colleges of Chandigarh is the finest. With passing of time, the Government Colleges of Chandigarh have been developed in Centres of Excellence. Chandigarh probably has the best infrastructure in terms of education all over the country, he added. On the occasion while talking to parents Mr. Mohan advised them to carry out brief sessions with their children to understand them better and to know what exactly are they going through, about their desires, needs, wants and problems. There are so many complexities in the contemporary world like growing competition, globalization, information revolution and to stand out from the rest students need to have a good and firm knowledge base. Home Secretary also affirmed that the knowledge imparted in schools, colleges and universities is formal while there also exists informal knowledge being offered by the Gurus, saints etc. He added that the importance of the informal education should not be belittled as after the combining the two an individual becomes a better human being. There is a huge difference between an educated and learned individual. Every individual who is literate doesn’t fall under the category of educated. Understanding life and its principles is imperative, he further added. Mr .Mohan also said that today’s generation is very well equipped and informed. But education accompanied with moral and human values is necessary for generating good citizens who have sense of responsibility for their families, society and nation. better focusing and also good health helps enjoying life. He also said that learning new things are very vital to outsmart others. Director Higher Education, Mrs. Raji P. Shrivastava, Principal, Government College, Sector 11 and faculty members were also present on the occasion.